The October 2018 TLS Gathering was indeed a Bountiful Harvest, for there were many workshops and presentations utilizing labyrinths in every way imaginable, from the arts, in reconciliation, labyrinths in business, with heart and compassion, in research, being reimagined, planting, sowing and harvesting, expansion of what we know, love and happiness, portals, inspiration, as a path through change, multi-dimensional, mystery, miracles and transformation, raw and organic, and embracing diversity and inclusion. We were led down the path of our history as a twenty-year old society by labyrinth historian Jeff Saward and geomancer Richard Feather Anderson. All five TLS presidents, from the very start to this day, were present and accounted for! The Bountiful Harvest Panel of Founding Members reminisced on how a small group of labyrinth enthusiasts created the organization we find thriving today and our hopes and visions for the future of labyrinths was expanded upon by the Sowing Seeds Panel of labyrinthers from around the world. Mornings started with breath and movement taught by Qi Gong master John Robertson. We walked together as a beginning and an ending, and danced on Saturday night, led by Conie Borchardt, upon the beautiful labyrinth created by Mark Healey and team. The TLS store was packed with incredible finds and the silent auction was once again a hit, curated by Dan Raven. 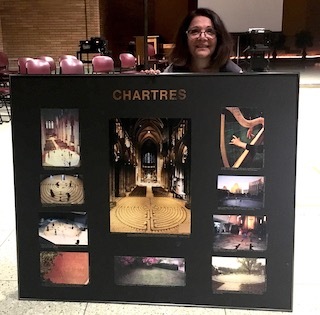 We feasted on beautiful poster presentations, including the eighteen-year old TLS Traveling Exhibit, photos, and a myriad of conversations that were inspiring and full of connections. 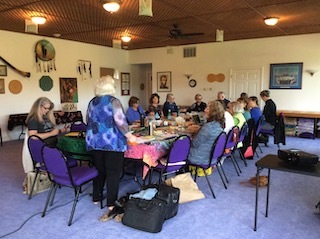 Pre-Gathering workshops brought creativity and tactile experiences with the finger-labyrinth art led by Lisa Moriarty as well as the art of dowsing by founding member Marty Cain. 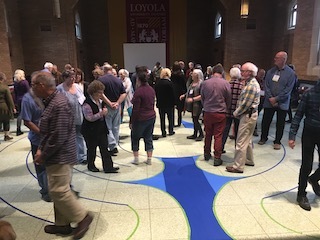 Post-Gathering activities included exploring the wisdom of the labyrinth by Gary Boelhower and touring the surrounding Chicago area labyrinths with Neal Harris, Janice Lewis, and Barrie Carter Gibby. Most precious of all were friendships rekindled and new ones made, with all sharing their passion and interests in everything labyrinthine. 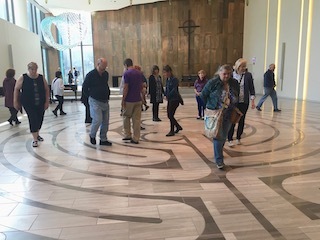 By the time it landed on the impressive grounds of the Loyola Eco-Center campus, the labyrinth that’s being touring all the border states of the USA in a journey of connection and healing, had travelled close to 8,000 miles. Folks at prisons, senior residents’ homes, schools, universities, libraries, city parks and even the National Mall had walked its path – so surely, here among a community of labyrinth lovers, many would come flocking to tread between its green border? For the hour or two that it rested between rain showers outside the main entrance to the Campus, its role was to spread energy, perform its silent work (unknown to me), and spread peace to all who were at the Gathering, and those beyond. Silently, without calling attention to itself, the labyrinth was packed away after I had completed my own usual ritual of circling it while saying my version of the metta (lovingkindness) prayer. Still, when I returned later close to the space where it had been laid, I knew that it was still spreading its work. This time, invisible to see, but still in situ, and declaring its power. 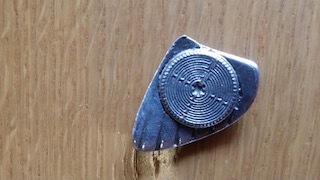 Marty Cain’s brilliant dowsing pre-workshop features among my highlights from the Gathering. The rods that I was handed, and seemed intended for me, seemed to want to go into orbit when I asked that they show me what was “yes”, and what “no”. So it was, a day after the workshop, that they were the very rods sitting at the front of the selection that were on offer for sale in the marketplace (I knew they were “mine” as they had quite a mark from a paper label on them). They called me then, and travelled home with me to the UK, where they’ve already helped me answer some important questions. This little labyrinth had another beautiful “find” in store for me when I spoke about LAA at Gathering – Fred himself was in the audience! I had no idea that he was with us, but what a joy to see him after I’d related my little story about the subway journey! 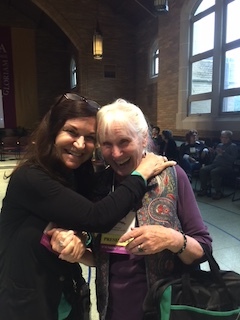 Frank Faine’s deeply rooted and experiential workshop at Gathering was, in my view, the most powerful that I attended, with a potential to be truly transformational. Frank’s work, through a variety of workshops, shared stories, and poignant challenges, seemed to strike home with all who attended, while the innovative and daring ways that he has used the labyrinth in his ministry with the gay community have clearly had a profound affect on many. In some ways, a brief workshop squeezed in to a busy Gathering schedule can scarcely do justice to Frank’s work, but it is something that I would hope more will be able to experience in the future. What he offers is a challenge not just to be aware of the specific fears, vulnerabilities, and sense of being different that many in the gay community feel, but an opportunity to “walk in their shoes”, and to deeply challenge worldviews that we might hold. As I think Maia Scott said of folks who may have some perceived difference in our community – it’s one thing to be invited to the party, quite another to be invited to dance. I suspect many of us have some way to go in being actively inclusive, even if that’s what we believe in and desire. THIS GIRL DESERVES A MEDAL! How about you look forward to going to Gathering, at which you’ve volunteered to help and are scheduled to speak, then you get ill? You bravely leave your bed to give your workshop, then return to rest, as the doctor you visited that morning said you should. You miss the singing, the dancing, the talks and the dining room chatter. You head back to the airport and then find that your plane is delayed for over eight hours. Resting on a seat at the airport while feeling poorly, still you count your blessings and don’t complain. That person is Carol Maurer. When I spoke to her since, she continued to speak about her relative good fortune compared to others, and how much she had enjoyed the short time at the Gathering when she’d felt well enough to leave her room. Give this girl a medal, I say! The timeline of the TLS Gathering coincided with the semi-annual meeting of the Veriditas Council I serve on, which highlighted to me the many points of connection and mutual support in our respective missions as non-profit organizations working to share the labyrinth in creative and supportive ways with the world. Modeling cooperation across organizations seems very important to me, as so often our culture is characterized by competition. I left the Gathering with some questions. What would it look like to broaden the scope of partnerships and relationships with other organizations especially when we’ve clearly identified a need to be more inclusive and diverse? For example, colleges and universities, inner-city non-profits like Pro-Act Indy, professional organizations, etc.? 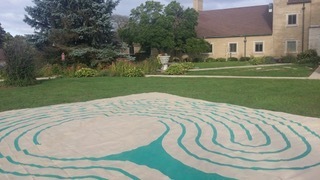 Often our focus is on building labyrinths, but also I have found that the careful and intentional community preparation for a labyrinth is a precious, generative and very important part of the process, helping communities to take an intentional look at the hopes and purpose and ways of engaging the community in creating and sustaining a labyrinth’s presence. What if we offered a group of resources and people who are willing to come alongside communities for the larger and longer conversation? Many communities and groups cannot afford professional consultation and builds…how do we partner with them? I saw glimpses of these possibilities in this year’s Poster Presentations at the TLS Gathering! 1. 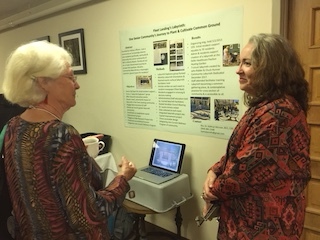 Diane Rudebock’s Poster Presentation on “The Companion of the Labyrinth in Spiritual Direction” offered important information on integrating the labyrinth with the growing field of Spiritual Direction. 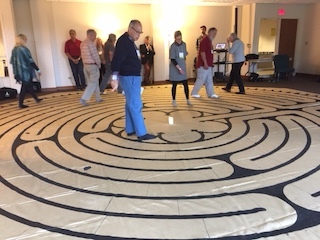 What if we partnered with Spiritual Directors International, or the Shalem Institute or Audire, The Central Florida Foundation for Spiritual Direction, to help Spiritual Directors integrate the labyrinth into their practice of being spiritual companions? 3. Lisa Moriarty offered a presentation about “Integrating Labyrinths on the Autism Spectrum”. What if we offered dedicated resources for Special Education teachers and in college curriculum to support teachers in integrating the labyrinth into their work with children with autism? 4. Kay Whipple’s poster highlighted very detailed, helpful steps into putting an Annual Gathering together…..How might this expertise in planning be a model for communities in planning local and regional labyrinth gatherings? 5. 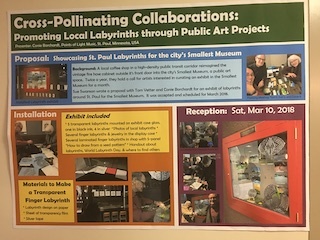 Connie Borchardt’s poster presentation encouraged “Cross-Pollinating Collaborations: Promoting Local Labyrinths through Public Art Projects” and highlighted her work in the Minneapolis area in this regard. What if we had a dedicated resource on the TLS website for communities seeking to integrate labyrinth work into Public Art projects in their communities? I think one of the most important ways to help partner with organizations is to provide current research and data about the labyrinth and its role and effects. This data is often required and necessary to help groups/communities/organizations justify, validate, and apply for funding, and to help them effectively educate their communities about the possibilities of the labyrinth in their particular context. I look forward to working closely with the TLS Research Committee in the next few years as we continue to identify ways to document, educate, encourage research, and provide practical, thoroughly vetted methodologies and best practices to be an effective resource for the labyrinth community. I’m thankful to the countless hours that went into planning and celebrating TLS’s 20 years as an organization - it’s an exciting time to be connected across the globe in this mutual work! As I reflect on this year’s Gathering, I find myself in awe of the richness our community possesses, and the abundant wealth of experience, sharing, and passion our members possess. What an incredible worldwide family we belong to! I appreciate the warmth with which we were all welcomed onto the beautiful grounds of the Loyola Retreat and Ecology Campus, and that, for a few days in October, we got to commune with eagles, walk enchanted labyrinths, listen to thunder and rain in the chapel, and reconnect with dear friends. We had a richness of workshops to choose from each day, and were elegantly led through the 20-year history of TLS by the featured presenters, Jeff Saward and Richard Feather Anderson. What will our next 20 years look like, I wonder? How will we embrace the challenges and opportunities we face? How will the labyrinth serve us, and how will we enrich the walks of others we meet on the path? I was touched and awakened by a lunchtime conversation with Marty Cain about the interconnectedness of all things. She inspires everyone she meets to be curious about and open to the mystery surrounding them. I look at rocks and trees (and everything!) differently now, and find myself saying ‘thank you’ for their existence more frequently. As part of a small group who built an outdoor labyrinth from natural, found materials during one of the breakout sessions, I am grateful for how generously the more experienced members offered encouragement and guidance to those of us who don’t frequently build labyrinths. What a sweet, albeit short-lived, labyrinth we created! Finally, as a new Board member, I felt welcomed into a caring, generous, accepting family. In a unique way, each Board member demonstrated to me that in The Labyrinth Society, people come first. They generously give of their time, serve behind the scenes, and are the glue that links all overs of labyrinths together. I can’t wait for next year’s Gathering!